Hey all, it’s once again time to look towards the week ahead and see what’s going on at Disneyland Resort. So, without further ado, let’s jump right into this week’s Disneyland preview! Last week, Space Mountain went down for its Ghost Galaxy overlay, and this week, it’s the Haunted Mansion‘s turn as it prepares for Haunted Mansion Holiday. Its last day of operation this week is Sunday, August 27. The end of this week marks the kickoff of the Disneyland Half Marathon Weekend! Races start on Friday morning, but the event begins with the runner’s expo on Thursday at the Disneyland Hotel. 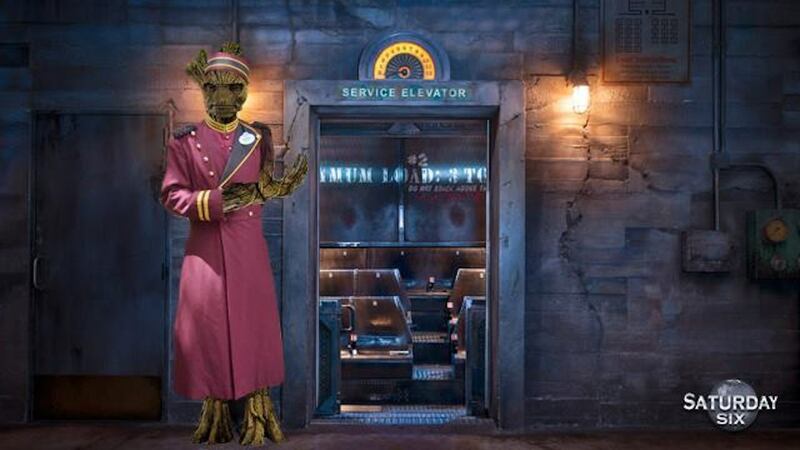 For those of you that are staying at Disney hotels, there’s still a little bit of time left to take advantage of the extra hour at the end of the night at Disney’s California Adventure to give you more time to ride Guardians of the Galaxy: Mission Breakout. You’ll be able to use this on Sunday, Monday, and Wednesday, but the promotion ends at that time. 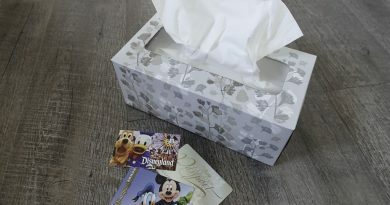 Also, we’ve been telling you about the Summer of Heroes at Disney’s California Adventure for quite some time now and it’s still going on, but it is nearing the end of its run. After this week, you’ll have a couple of weeks left before it goes away, so if you want to experience it, start making plans now. Check out Derek Burgan’s write-up on the event if you’ve not been before to get the most out of it. 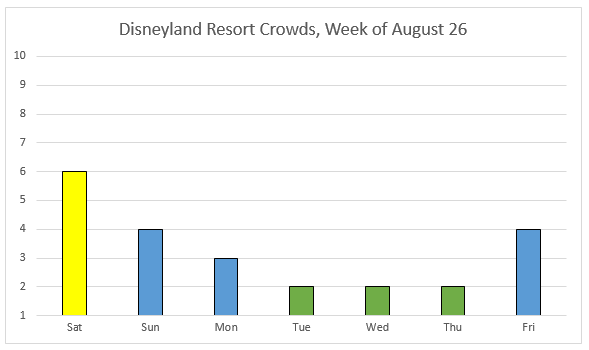 After a little mini-rush last week as Annual Passholders returned, this week sees a significant drop in crowd levels, and Disneyland will have some of the lowest crowds it’s had in many moons. Indeed, we’re predicting level 2 crowds from Tuesday to Thursday, and even the busiest day, Saturday, is still relatively light compared to the months that preceded it. Here’s the good news: the week is going to be pretty dry, with no serious chance of rain anywhere in the forecast. The bad news, however, is that you’re probably going to yearn for a little rain, because it is going to be H-O-T. Highs are predicted to hit 100° on Monday and Tuesday, and you’re looking at temperatures in the mid-90s pretty much all week long. Disney typically dials back its show schedule when crowds are lighter, and this week follows that pattern. World of Color and Mickey’s Soundsational Parade will happen twice on Saturday, Sunday, and Friday, and once every other day. Fantasmic! 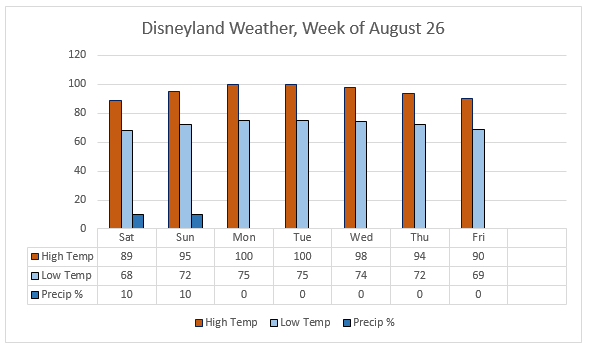 will only run on Saturday, Sunday, and Friday, but will run twice a night on those evenings at Disneyland Park. 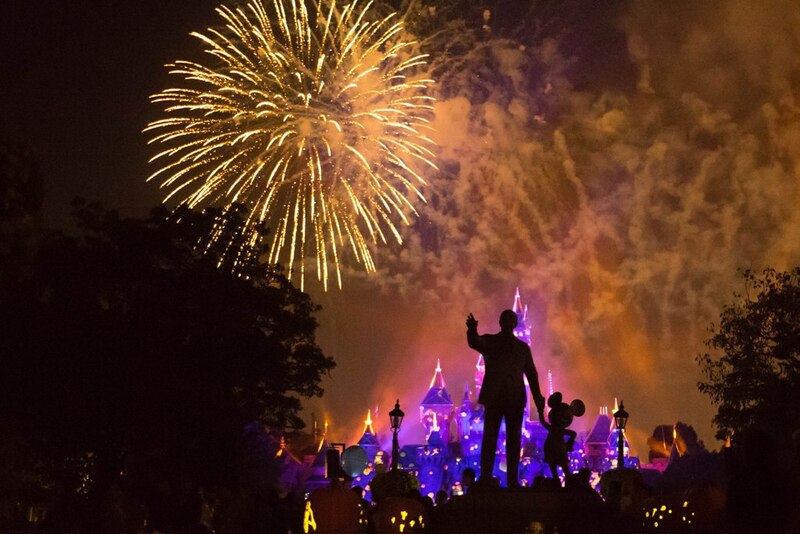 Similarly, the Remember…Dreams Come True Fireworks Spectacular will only run on Saturday, Sunday, and Friday, and will run once on those days. At Disney’s California Adventure, the Pixar Play Parade is currently dark and will not run at all. Detailed show schedules, including smaller-scale performances like the daily Flag Retreat Ceremony, can be found here. More relaxing of Annual Passport blockouts this week. Southern California Annual Passport Holders are only blocked out on Saturday, and SC Select are blocked out Saturday and Sunday. All other Annual Passports will be honored all days of the week. For those of you buying tickets as day guests, single-day tickets are at Regular cost ($110 adult/$104 child) for Saturday and Sunday, Peak ($124/$118) on Friday, and Value ($97/$91) the remainder of the week. Other than Space Mountain and Haunted Mansion noted above, just a handful of closures to note. Main Street Cinema is currently closed through September 30, and of particular interest to me, you will be unable to get the Best Corn Dog on Planet Earth until September 10, as Little Red Wagon Corn Dogs will be down during this time as well. The Frontierland Shootin’ Exposition will be undergoing a very short refrubishment and will be closed from Monday-Thursday. At Disney’s California Adventure, Character Close-Up is still being replaced by Frozen’s Anna and Elsa. Looking ahead, Soarin’ Around the World and Monsters, Inc. Mike & Sulley to the Rescue! are undergoing brief refurbishments starting on September 5. Soarin’ will return shortly thereafter on September 7, and Monsters will return on September 23. Over at Disneyland Park, Finding Nemo Submarine Voyage will be closing September 18 and returning September 23. Additionally, River Belle Terrace and Buzz Lightyear Astro Blasters will be closing indefinitely on September 5 and 25, respectively. Keep those dates in mind if those attractions are an important part of your trip! 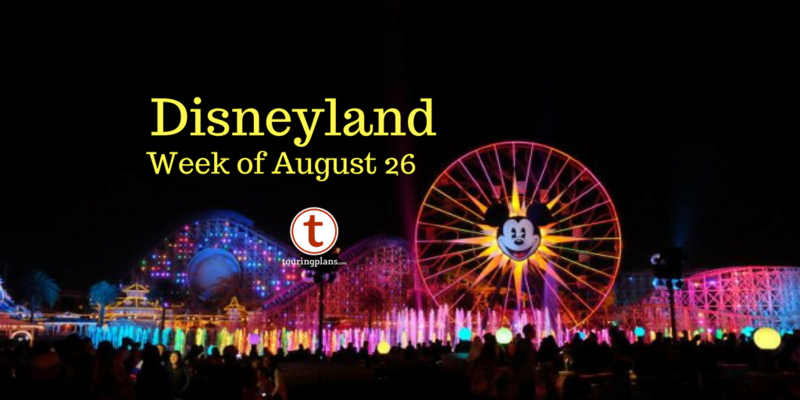 Seth & Daisy’s Best Week Ever October 29, 2015: Disneyland!